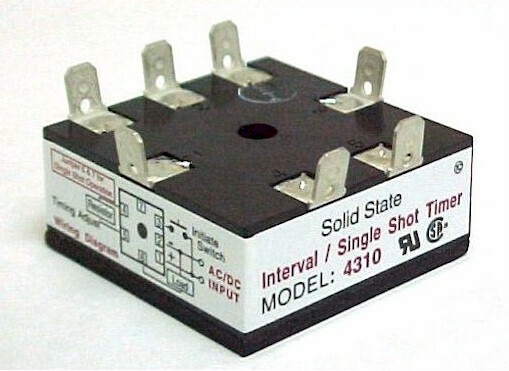 The model 4310 can perform as either an interval timer or as a single shot timer. It controls DC load circuits to 1 ampere and AC load circuits up to 10 amperes. The AC models provide zero voltage or random switching when turning ON the load circuit. To use as a single shot timer a jumper across terminals 6 & 7 is required. Operating as a single shot timer, the load will remain ON for the full timing duration even if the initiate switch closure is momentary. Without the jumper the 4310 performs the function of an interval timer. Operating as an interval timer, the initiate switch must be closed longer than the timing period. Available in both fixed and adjustable timing models. Output -A & -C models rated for 20 milliamperes to 1 ampere inductive. -B & -D models (AC only) rated for 20 milliamperes to 5 ampere inductive, 10 amperes with external heatsinking.